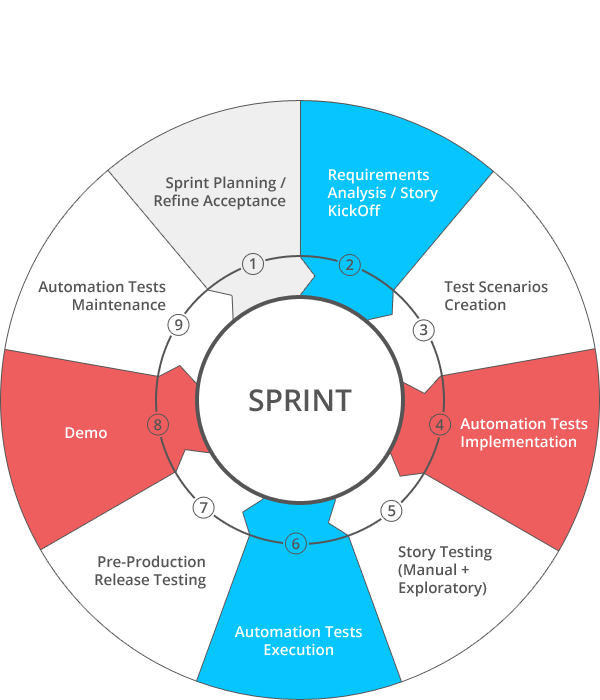 Oxagile offers full-cycle testing and quality assurance services for desktop and mobile applications. Expert test engineers are an integral part of every project we work on to ensure the deliverables meet the most stringent quality standards. We also leverage our QA talent pool to provide standalone software testing services by means of custom dedicated QA teams. A dedicated team reports directly to the client, and works exclusively on a single project, closely collaborating with the client’s staff. This approach has proven very effective for mid- and long-term projects that require ultimate resource scalability and product knowledge retention. A top-notch software testing company, Oxagile employs a dedicated QA unit of 60+ quality assurance experts, including ISTQB®-certified engineers. We are highly motivated, results-oriented, and have a passion for constantly improving our processes and workflows. Our engineers are well-versed in all the standard test types and beyond. Whether testing functionality, performance, UI, or localization, conducting security audits, or implementing complex test automation — we got you covered! Underlying our software testing services is the approach that relies on trust and 100% results visibility. You are always in control, with full access to complete QA reporting, which includes test results, test coverage, quality level and status reports, quality trends, sign-off reports, and more. Over the last decade, our QA team has been providing high-quality software testing services across multiple business domains. Our particular forte is e-Commerce, Entertainment, Advertising, Data Analytics, Online Video, Telecommunications, and EdTech. While fully supporting the traditional waterfall process if a project demands it, we do lean heavily towards agile and scrum-based workflows to better mitigate risks, reduce time to market, and deal with changing requirements in a more efficient manner. Underpinned by our man-years of experience and industry’s best practices, the Oxagile approach emphasizes early testing, predictability, efficient communication, and detailed reporting. We are also big believers in QA automation, and advocate implementing a test automation strategy whenever it makes sense and benefits the project. Check out the unique business challenges we have solved for the world’s leading companies. Online video, machine learning, big data, business intelligence, IoT, and more — we synergized our multi-year software testing expertise around key tech domains to dive deep into each projects’ specifics and achieve measurable business results. The team leveraged 3,500+ test cases to ensure superior product quality. Special attention was paid to business-critical notification mo­dule that generates emails and content for a variety of users and events. The project required rigorous testing of video encoding and transcoding, live streaming, and multiple subscription options. The total number of test cases for desktop and mobile browsers surpassed 6,300. The QA team leveraged its expertise in the e-Learning and video streaming domains to conduct advanced performance, configuration, compatibility, and system integration testing of the entire LMS platform. Leverage our QA expertise to deliver a well-tested product of superior quality, improve time to market with continuous delivery and test automation, and dramatically reduce your cost per change by detecting bugs early. Contact us now, and a QA consultant will get back to you to discuss your testing needs.